Attendance: China, Chinese Taipei, Mongolia, Brunei, Cambodia, Laos, Philippines, Thailand, Viet Nam, Bangladesh, Bhutan, India, Nepal, Sri Lanka, Jordan, Georgia, and Papua New Guinea. To celebrate the inaugural meeting of the RCC, members from 17 countries endorsed RCC as a mechanism for dialogue, exchange, and as a means for developing practical cooperative programs between member countries at the regional and sub-regional levels. The meeting provided experiences of major disasters, lessons learned, institutional initiatives and practical ways to enhance the effectiveness in disaster management including political support. The first RCC meeting constituted a greater whole, and on the last day, the forthcoming events of the RCC were discussed. • Provide inputs to current and planned programs of ADPC. A thorough introduction of the RCC mechanism was given covering the role of the RCC, the need for regional dialogues on disaster management, the constitution of the Steering Committee and the role of ADPC in promoting the dialogue, significance of scientific findings of hazards available to the decision making community, stock taking exercises to understand disaster management capacities of countries, and importance of seeking political support for mitigation. Discussions stressed the importance of mitigation and preparedness activities, and a suggestion was made to develop a subregional institutional mechanism for the sharing of information, expertise and knowledge on disaster management. Key issues and priority needs, such as, need for effective water resource management, capacity building in disaster management and mitigation, model of disaster management legislations, and strengthening of rural infrastructure were discussed. Successful disaster management activities were highlighted to build capacity, training and public support for disaster management and mitigation. These included the establishment of disaster management committees, the importance of integrating DRR into curriculum development, improving the training and capacity across countries and improving the roles of media. Under the future direction of RCC, the last session discussed the utility and benefit of the RCC mechanism, ADPC should be facilitator and convener of RCC consultative mechanism and its role in the next RCC meeting, issue of RCC expansion, and importance of organizing a high level Asian Ministerial Conference on Disaster Risk Reduction (AMCDRR). The outputs of the meeting were given through recommendations: need for effective water resource management, ADPC to circulate the model of disaster management legislation among all the countries, each of the participant countries has areas of strengths which could be utilized to build a better complementary relationship in the region, and promoting small demonstration projects. 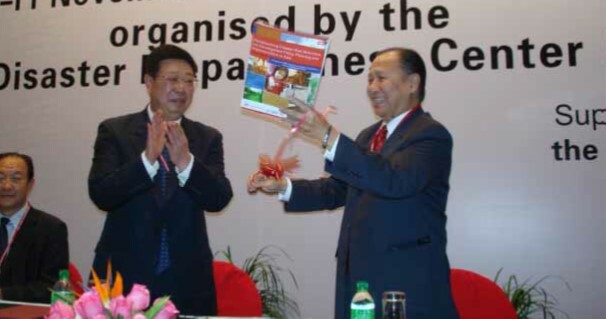 In addition, recommendations were also provided on the common country experiences in the area of building capacity, training and public support for disaster management and mitigation; development of National Disaster Management Plans (DMP) and information systems; improving legislative and institutional arrangements and enhancing political will for disaster management and mitigation; integration of disaster risk reduction into national development process; and scientific and technical inputs for disaster management (including early warning). It was agreed that the RCC meetings should take place about once a year with ADPC continuing its role as convener and secretariat. ADPC should also act as the regional focal point and technical resource for the RCC on disaster management.